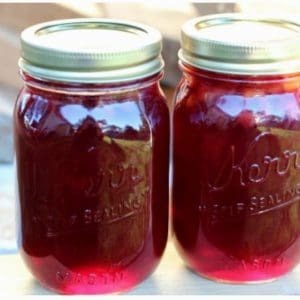 September 20, 2016 0 comments on "Canning Elderberry Peach Jam"
If you are fortunate to live near a place where you can pick wild elderberries, then you are in for a real treat. Elderberries are pretty sour on their own, but when you combine them with peaches, they turn into a really sweet treat. And, canning elderberry peach jam is easier than you think. Elderberries have also been used for their medicinal properties for centuries. Learn about the health benefits of elderberries. Rinse elderberries. Place in a large sauce pan with 1/2 c. water. Simmer for 5-10 minutes, until elderberries are soft. Mash elderberries with a potato masher. Place elderberries in a jelly bag to strain juice. Measure 1 1/2 c. juice, adding a little of water if necessary to make exactly 1 1/2 cups. Combine elderberry juice, peeled and chopped peaches, lemon juice, and sugar in a large sauce pan. Stirring constantly, heat until boiling. Boil for one minute. Add the butter and return to a boil. Add the pectin. Return to a boil and boil for one minute. Remove the pan from the heat. Remove any foam with a metal spoon. Ladle the jam into hot sterilized jars, leaving 1/4 inch head space, and process in boiling water canner for 5 minutes. Like this recipe? Try my recipe for elderberry syrup.